Home Again: Friday's FAVE Five ~ LIFE! Mennonite Girls are going Global? You can see it alive at What Matters Most. We are all pinching ourselves with glee. Doesn't she look like a typical Mennonite girl? I'm sure she can cook too. 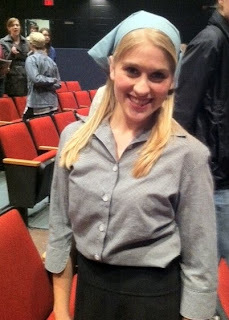 from the muscial, Fiddler on the Roof. What an outstanding performance by Abbotsford Traditional School! Can you find this available on line at Martha Stewart's? I was peering out the window...Fire trucks? Ambulance? Who's hauling away the old Civic....? Or will they revive it? to gain perspective of life and it's realities. Enjoy your time and appreciate the ones you love. I watched Lovella's interview and I am SOOOO EXCITED for you gals! 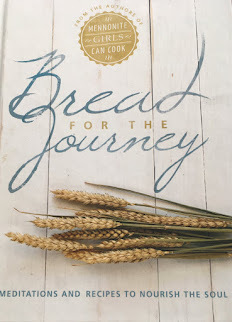 I will definitely be ordering a copy... My daughter Amanda also follows MGCC ... she is my chef! Oh so happy for you and I love your philanthropic venture! off to work now... we had a two hour snow delay and I enjoyed it to the last drop of my second cup! Congrats on MGCC having that Global interview - what an opportunity! Blessings! It seems we have walked through the same week with a few minor variances. Thank you for your perspective. .it is always fresh. What a week for sure. Glad we know the one who holds the future! Your niece looks so sweet all decked out. I love Fiddler on the Roof! Is that cookie jar full yet? So sorry to hear of your friend's death. Congratulations to your niece - what a fun part! 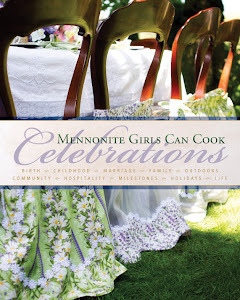 And double congratulations to you and the cooking Mennonite gals - what an accomplishment! Yes, our lives do have parallels. We just got our Honda out of the repair shop and the steering wheel is turned at 90 degrees. They said it wasn't their fault, but it will have to be fixed again or Katie will go nuts driving. Maybe she should just sell and start over. Congratulations on your cooking blog and its success. Please let me know when the books are available. What a lovely way to do an overview of your week...a picture paints a thousand words. Thanks for the heads up on the interview. I missed it on global but enjoyed watching it on Youtube. Is the cookbook available already. Hum... I just posted a lovely to your blog and I got an error. Well this is to let you know I was and visited an I'm so excited for you girls. This might just give me another error so I'll try to post the comment to see. All this attention about the cook book is so exciting! Are you getting lots of 'interesting weather'? Snow? Rain? Cold? Stay warm and safe! You must be so proud of your niece! I love that musical! Yes...we had a friend recently pass...to heaven. You are right...it makes you think. (But good thinking)--re-affirming your faith...treasuring your loved ones. My mother had two of her friends pass away just last week. I was sad for her. I know it is hard seeing so many of your friends and family leave. My grandsons would LOVE that cookie jar ~ even if it were empty! I am sorry about your friend. Life certainly has its share of ups and downs. Hope this upcoming week is full of sunshine and laughter. Take care. I'm sorry about your friend. May God comfort your hearts. 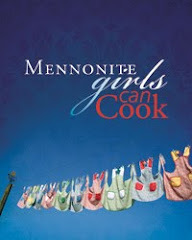 So excited for all you Mennonite Gals. What fun times for you all.